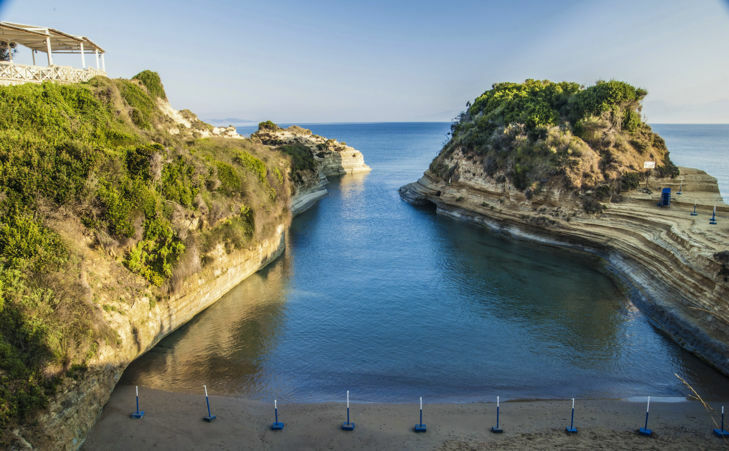 What appears to be a small rocky peninsula in the Sidari area of Corfu, created a gorgeous inlet that has become one of the most popular beaches on the island. Sidari’s main beach is a 500 metersstretch of Blue Flag sand and shingle. The waters here are calm and shallow. Within the idyllic town of the island can be found a very picturesque and traditional church with a characteristic red color on its highest point. It is a single-nave basilica and its bell tower is the highest in the Ionian Islands. It is the most famous church in Corfu. Aspri Ammos which in Greek means white sand is just that. A gorgeous calm beach in Corfu island with very white sand.It’s a great place to get away from crowds. Dassia beach on the other hand is very popular even though it’s small. Its clear turquoise waters attract both natives and foreigners. There’s plenty of shade from the olive trees that fringe the beach. You’ve got a huge collection of water-sports. 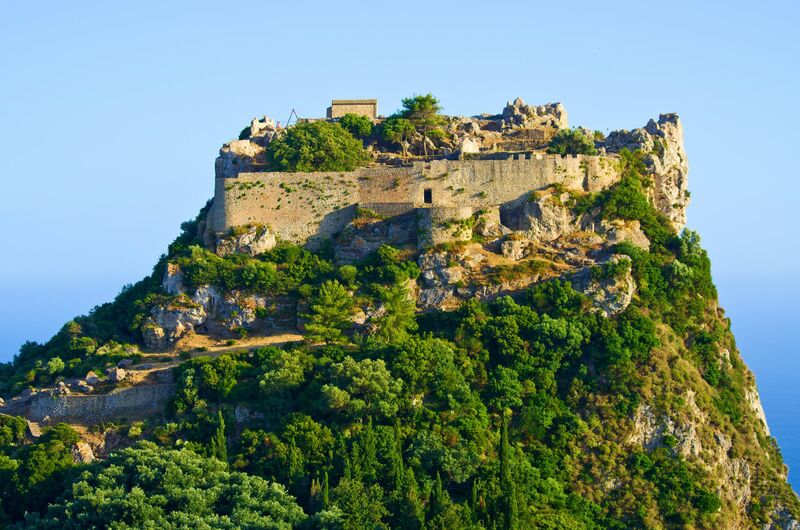 Angelokastro is a byzantine castle that can be found on the highest part of the island. It’s very beautiful but what’s even better is the gorgeous view of the whole Corfu. It is located at the northwest coast near Paleokastritsa and built on particularly precipitous and rocky terrain. 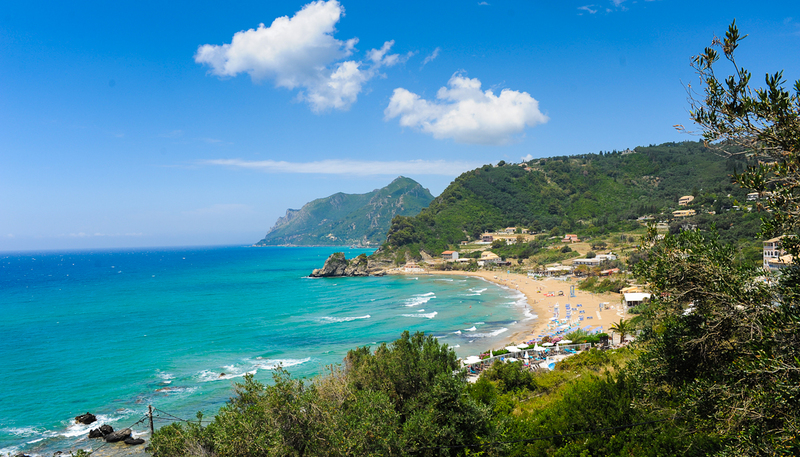 Pelekas is another lovely beach in Corfu Island that everyone loves. When there’s waves it perfect for activities such as windsurfing. Pelekas village It stands on one of the most beautiful hills of the island offering breathtaking panoramic views. Pontikonisi is a tiny rocky island near Corfu’s airport. It’s popular for the Byzantine Chapel of Pantokrator that’s been built on it. Boats will take you there either from Kanoni, outside the monastery of Vlacherena, or from Perama. You can also swim there. Chomoi is one of the most magical beaches in the island. The sandy part of the beach itself is actually very thin. There are sheer cliffs behind it but the waters are crystal clear and sand is soft. Zoom out from Pontikonisi and you’ll find what appeals like a thin pier in the sea leading to another tiny rocky island. This is the Vlaherna Monastery and is one of the most iconic places in the island. Paleokastritsa is the most touristic and beautiful place in the island. The whole area is amazing but the beach is absolutely breathtaking. Paleokastritsa is considered as one of the loveliest places in Corfu and in whole Greece.